You may have heard the old saying that you get only one chance to make a first impression. In the world of European and international Programmes writing your proposal is that crucial first step. This training course is the ideal preparation for your future European project proposals for funding programmes. You will be prepared for the 2014 – 2020 EU programme period – we do our best to accelerate your success. With this training seminar based on two steps, you get an overview on the new funding programmes and in addition this is all about composing and delivering high quality project proposals. 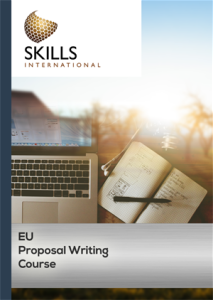 The Project Development and Proposal Writing Training can be attended onsite, as staff training course for organisations that apply for Erasmus+ funding, online or blended learning course combining onsite presence with eLearning and webinars.